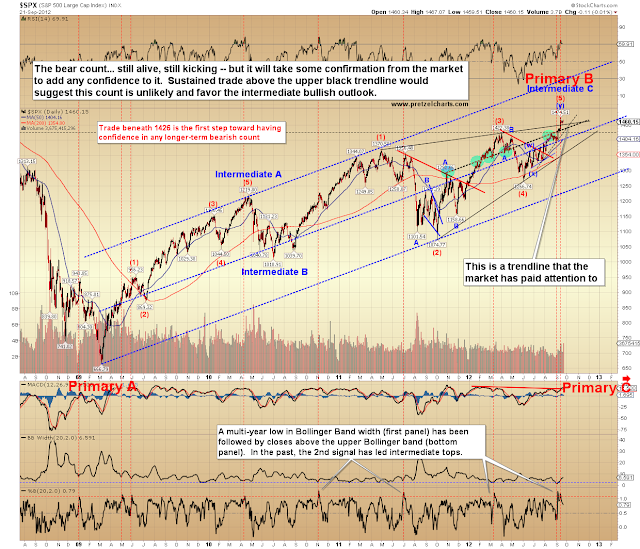 Pretzel Logic's Market Charts and Analysis: Dow Theory Gives Warning; Can the Fed "Print Over" It? 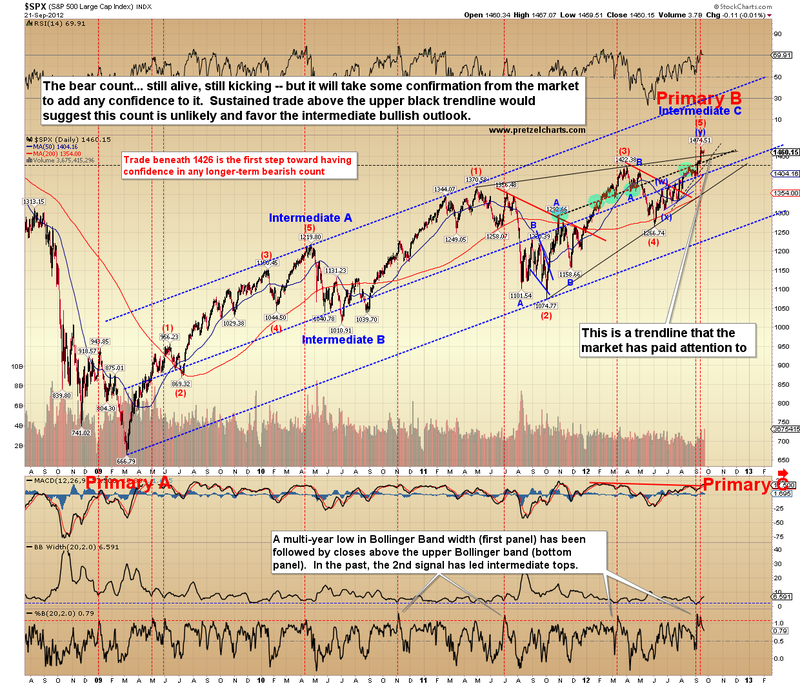 Dow Theory Gives Warning; Can the Fed "Print Over" It? In this article, I'm going to discuss Dow Theory, the dollar and inflation, and how they relate to the Federal Reserve in today's market. 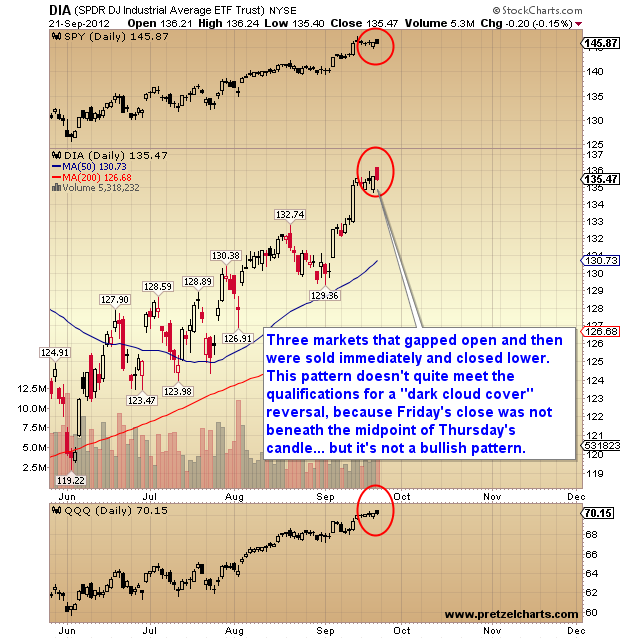 Dow Theory views directional divergences between the Dow Jones Industrial Average (INDU) and the Dow Jones Transportation Average (TRAN) as important, and the two markets are diverging significantly right now. There are six basic tenets behind Dow Theory but, for discussion purposes, the one we'll focus on today is the tenet that the market averages must confirm each other. As its name suggests, the Dow Jones Industrial Average is concerned primarily with industry, i.e.- the production of goods, while the Transportation Average is more concerned with shipping those goods to market. The logic behind the theory is fairly simple: If the economy is improving, then economic production should be increasing (positive for INDU), which also means there will be more goods needing shipment (positive for TRAN). Logic tells us the reverse should also be true: less production should equal less demand for shipping. Thus the two averages would seem inexorably linked in an economic sense, and should generally be moving in the same direction. 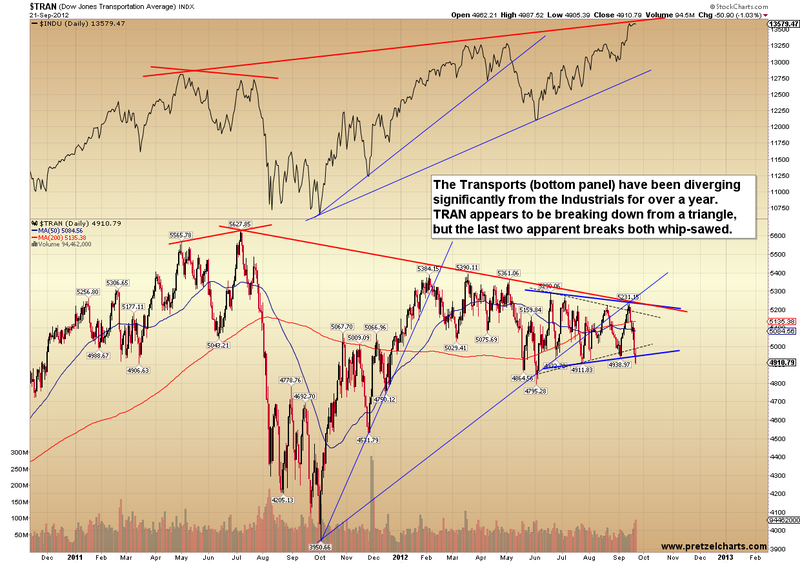 According to Dow Theory, when the two indices diverge, it's a warning that a trend change may be brewing. Dow Theory finds its roots in editorials written by Charles Dow, who founded the Wall Street Journal. He remains a household name with investors because he also co-founded Dow Jones and Company (presumably his co-founder had the last name of "Company."). Mr. Dow passed in 1902 and therefore never had to contend with the Federal Reserve, since the Fed wasn't an entity until 1913. In Dow's day, the gold standard still existed, so money couldn't simply be "spoken into existence" by Mr. Bernanke and his printing press. Back then, money was viewed, first and foremost, as a way to exchange goods and/or services without the need for direct barter. In other words, in 1902, wealth could only be created through the archaic concept of production. Of course this is no longer the case, and we have since realized that the concept of "earning" money is just plain silly and old-fashioned. Once the government discovered they could create money out of thin air (via printing press) without having to actually do anything to earn it, the rules of the game changed completely. The American dollar is really just a convenient and easily-exchangeable symbol of energy. You expend your personal energy, time, and resources in exchange for dollars -- which you can then trade to others as payment for their energy, time, and resources. So the dollar is, if you will, the symbol and storage-place of our collective national energy. The problem introduced by the printing press, of course, is based on the fact that the dollar is merely a symbol -- if we remove our energy from the equation, then it has no intrinsic value of its own. Symbols are only as valuable as the concepts they represent. So, if the dollar represents the hard work of the American people, then it should be equally as valuable as that hard work. But if the dollar represents the hard work of the American people plus a few trillion extra dollars that represents nothing more than the "hard work" of a printing press, then the value of this symbol becomes accordingly diluted and uncertain. Incidentally, this is how your wealth is depleted by inflation. Each day you go to work expecting to earn a certain amount... and, naturally, your expectation of the value of what you're earning is measured by what that money was able to buy in the past. But every day the printing press runs, that value is diluted. Thus we are always being paid a little bit less than we think -- we're simply not aware of it because we base our expectations of "value" on past experience; and we are unable to foresee how our purchasing power will be diminished in the future. The point I'm getting at is that when Mr. Dow was making his market observations, the rules of the whole game were different, and money had some discernible -- and reasonably consistent -- level of value. In the early 1900's, the price of the Industrials and Transports was more directly tied to economic production. In today's world, the price of equities is not necessarily even relevant to the real economy, and is sometimes relevant only to the amount of liquidity flowing into the market from the central banks (printing). 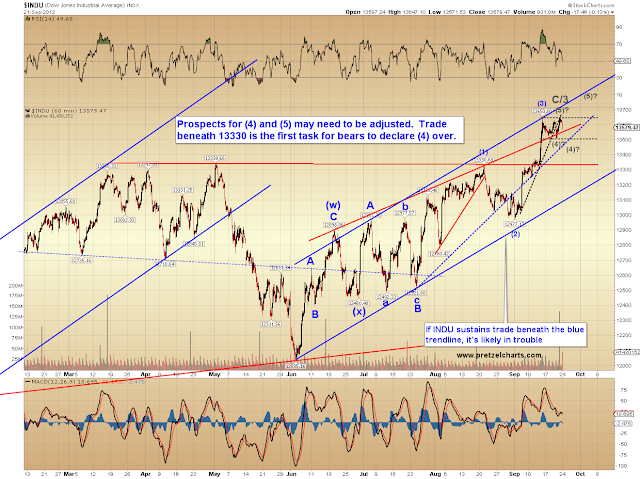 Should Dow Theory still have any credence in today's world of QE-Infinity? I genuinely don't have an answer to that question: we are in uncharted waters. The Transportation Average does seem to be pointing the way, for the "real" economy anyway, and important constituent companies such as FedEx (FDX) and Norfolk Southern (NSC) have recently expressed serious concerns regarding future economic outlook. The global economy appears to be weakening further. Will reality bite the market sooner rather than later, or will the printing press allow the Industrials to continue behaving in an oblivious fashion? That's where things are challenging from an analytical standpoint. 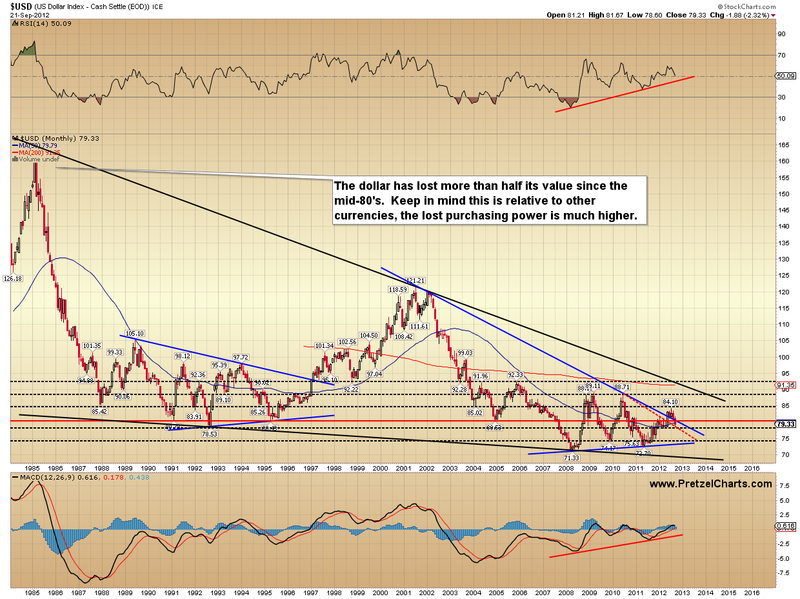 In any case, given the discussion, it seems appropriate to start off with a long-term US Dollar chart. Moving on to equities, Friday's outlook suggested that if the S&P 500 (SPX) traded above 1462, that would lead it to a short-term target of 1466-1468 -- this all happened right off the open, with the SPX peaking directly in the middle of the target zone, at 1467.07. The charts also suggested that trade above 1466 could "solidify" the short-term bull case, but as I mentioned in the body of the article, I was only discussing the two highest probability larger-degree wave structures. With Friday's price action now revealed, the form of the rally and subsequent decline have left ambiguity in their wake. The decline on Friday looks more impulsive than the last rally leg did, but an extended sideways consolidation (triangle) can't be ruled out yet. Beyond that we'll simply have to watch and see who claims the next key level. The candles on the daily charts are not showing a bullish pattern, and suggest the current risk may be on long positions. The bearish count is still alive, but whether the next decline will only be a correction/consolidation, or turn into something more serious is still unclear. There is a key trend line noted on the chart, and it will be worth watching how the market responds to that level going forward. NYSE Composite (NYA) outlines some prospects for the bull case; and all markets can be considered to have similar prospects still open at the moment. The form of the next correction/consolidation will help determine whether there's any validity to those prospects. The Dow Jones Industrials (INDU) may have completed a full wave sequence, though the next key Fib resistance level of 13,800 hasn't quite been reached yet. 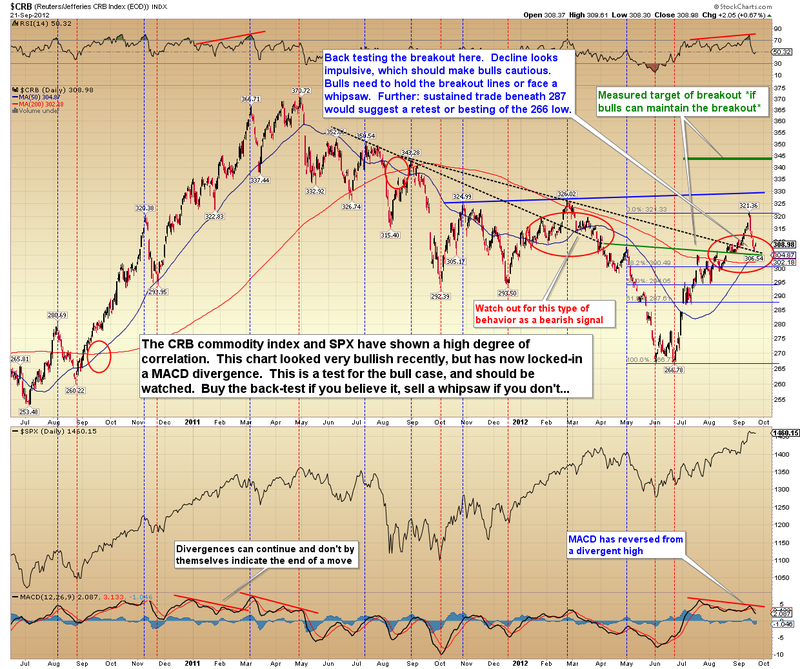 Commodities are facing a test of the recent breakout. The London FTSE (FTSE) is also worth watching, since it was recently rejected at resistance and remains below its 2011 high. Finally, a simple trend line chart of SPX. In conclusion, Friday's action indicates that some type of correction/consolidation appears reasonably likely here and that risk is increasing for longs. 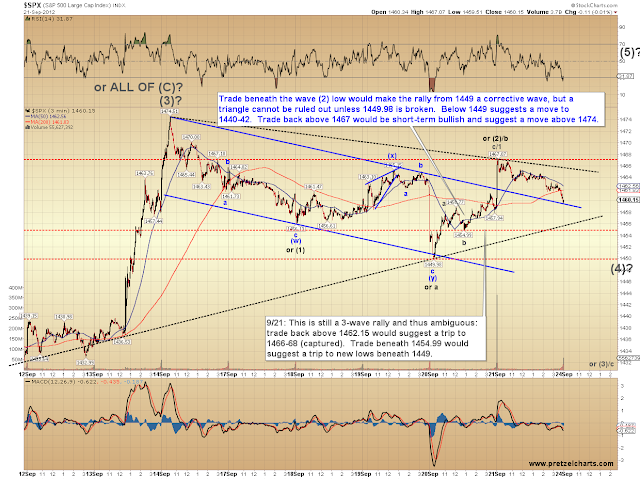 The shape of the next move will help determine prospects going forward. Trade safe. 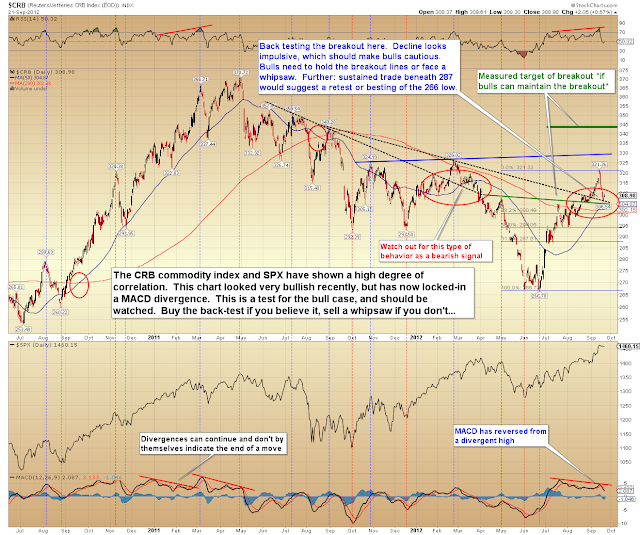 Looking back at what the markets did following QE1 and QE2, I would expect the same from QE3. 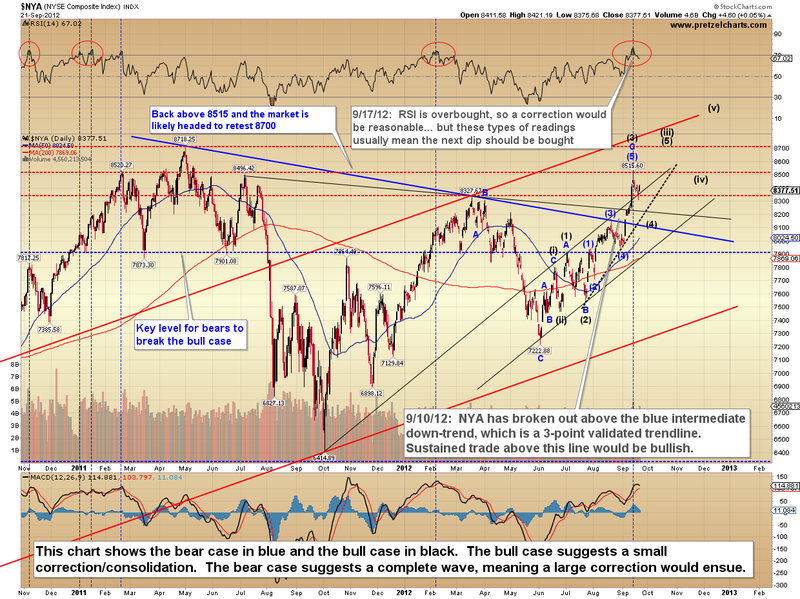 At present the market may have a slight correction or a period of consolidation but the upward momentum will continue. Sometimes consolidation phases can take their time. Just look at how long the market was stuck at the 1400 level before bouncing higher. 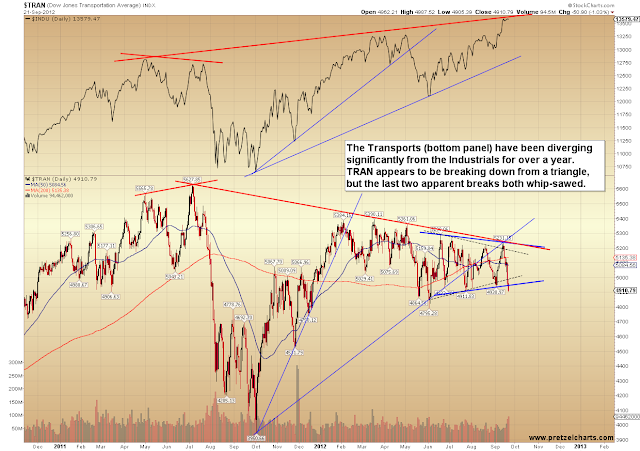 As far as the divergence between the DJ industrials and transports are concerned. we have seen previous divergences that were simply the result of the transports lagging behind and catching up a short while later. Not sure I would read too much into this at the moment unless it keeps dosediving further. 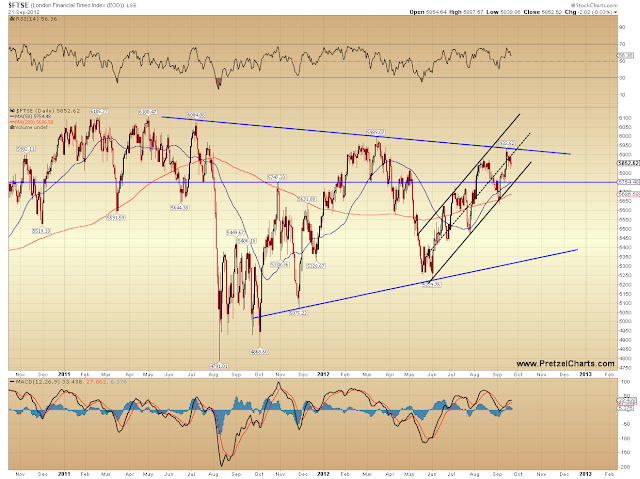 At present it is at 4960 and back in Sep 30 2011 it was at 4189. Going back a bit further on March 6 2009 it was sitting at 2195. 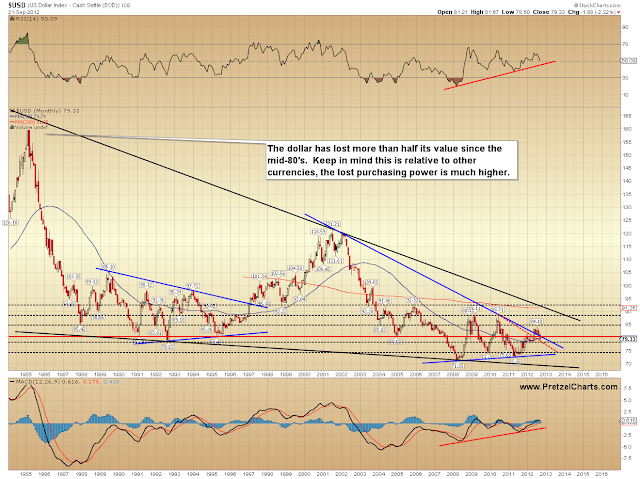 Please remember that the FED (and trend) is your friend. The Euro worries seem to have settled down now that they too are printing their way out of their problems.With all this liquidity where's a gal going to put her money? Thanks PL for another great post. 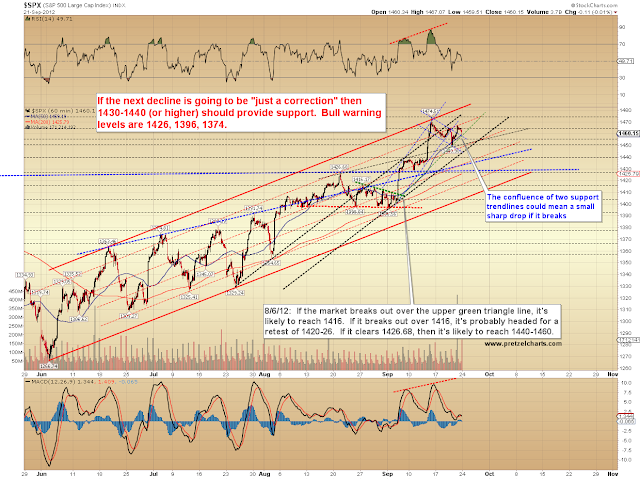 I have been in the markets for almost 20 years but am new to technical analysis. Your posts have helped me learn alot in understanding. Keep up the great work.